I was lucky enough to win this book on Goodreads. I knew from the first few pages that it was not going to disappoint, but Jaxie’s slang took some getting used to. And then I thought an audio version of the book might be just what I needed. I am so happy I spent a credit to get this book. Kate Mulvany’s narration is absolutely fantastic! I wasn’t sure what to think when I saw the narrator was female, but she is a gifted narrator and was fully convincing as a 16 year old boy. I couldn’t recommend this book highly enough. The writing is beautiful and authentic, and very evocative. 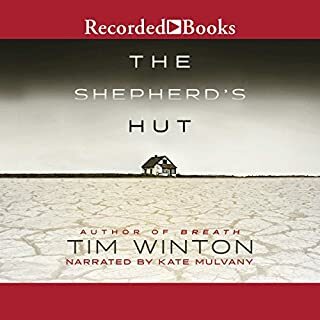 I have three other books by Tim Winton that have been sitting on my shelves for years and now I wonder what took me so long to discover him. I will most definitely be reading more of him. In the meantime, here’s hoping that the Shepherd’s Hut will make the Booker longlist this year. It is well deserving and a book that will stay with me for a long time.